It's just been announced that The Gospel According to Mattei has won an award in Moscow for Best Independent comedy... "A work that follows in the tradition of commedia italiana". The film will be released in Italy during the Fall of 2017. The people of Basilicata, referred to as Lucani, possess a number of admirable qualities like strength, integrity and creativity. However, the quality I admire most is their sense of humor. For years, their region has been the subject of unfounded criticism. In one recent article, a Rome-based foreign journalist described the region as “dying mountain towns”. Since Matera was named the 2019 European Capital of Culture just over a year ago, travel agencies throughout the world have designed tours, bringing thousands upon thousands to see the Sassi of Matera, a UNESCO World Heritage Site. Throughout the years, Hollywood and Cinecittà have transformed this so-called dying region into movie sets for films like The Passion of the Christ, Ben Hur, 007 and Edoardo Leo’s award-winning Noi e La Giulia. The people of Basilicata have thick skin and they usually just laugh off empty criticism. However, for the past couple years, the Lucani have been facing a serious issue. A 2014 report released by the BP Statistical Review revealed that the region holds the bulk of Italy’s petroleum reserves, and major oil companies are lined up to get their piece of the pie. In many articles that I’ve read, the common thought of the journalist writing from a computer hundreds or thousands of miles away, is that the extraction of petroleum will bring jobs and money to an already “suffering” economy. Well, they’re wrong. Instead, what’s happening is these drilling sites are interfering with nature-based tourism such as skiing and hiking, and the local gastronomy production of vegetables, cheese, wine and olive oil- therefore doing exactly the opposite of what these journalists are writing since most likely, they have never traveled to the region to see it firsthand. I, however, have been traveling to the region on a regular basis for the past 14 years and every time I am there, I experience a bustling culture with crowded superstores, restaurants, traffic jams, tourists and beautifully maintained historical sites. I always have the same reaction after reading these articles- What are they talking about? Sure, young people leave the region in search of jobs but this occurs everywhere. Young people also leave Italy in search of jobs- including the northern regions of Tuscany, Lombardy and Veneto.. yes the regions which house cities like Florence, Milan and Venice. Perhaps even more serious than the problems created by the coexistence of agricultural farms and intense drilling activity is the fact that much of Basilicata is at risk for intense seismic activity, especially in the territory of the Agri Valley in the Apennines. The area has been under scrutiny since the presence of this extraction process during the last few years. According to a report by the COVA’s – (Oils Centre in Agri Valley), the crude oil extracted from the wells is sent through an oil pipeline to the neighboring Puglia region. All this activity could provoke seismic events in the area. However, that doesn’t seem to be of any concern to officials and biased journalists in favor of the drilling. Relentless in their displays of opposition to oil drilling in their region, whether it be carefully organized manifestations or writings on social media, the Lucani are not taking the invasion of their land lightly. Enter filmmaker Antonio Andrisani. If there is anyone who embraces all of those aforementioned qualities including creativity and a sense of humor, it is him. Juggling the roles of writer, director and actor, Andrisani has made a career out of the ironies of Basilicata and the naiveties and stereotypes of the outside world. Andrisani’s laugh-out-loud sketches on YouTube have been watched thousands of times over. His latest installment is a mock news story titled, Breaking News: the Prisoner of Rai 1 - a skit about an elderly man trapped inside the preparations for RAI’s live New Year’s Eve show from Matera. Luck was on my side this past September when I received a text message from Riccardo Zinna while traveling through Basilicata. Zinna is a multitalented Neapolitan artist- an actor, musician and painter. I've been writing about his work for years, and met him in Rome in 2013 at an exhibition of his artwork. His text message was to advise me that I just happened to be passing through Matera while he was filming a movie with Flavio Bucci. Since my articles are geared towards contemporary Italian cinema, I only knew Bucci from his part in Paolo Sorrentino’s 2008 Il Divo. 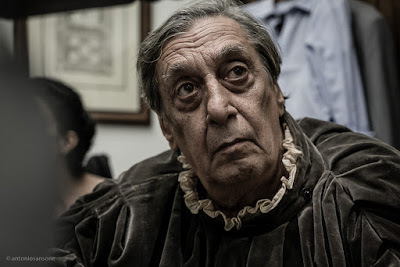 But it turns out that he is a veteran theater and screen actor best known for his collaborations on Dario Argento’s 1977 Suspiria and Aldo Lado's 1975 Night Train Murders. I was just so happy for the opportunity to see a film crew in Matera, I jumped at the chance and went on my way to find the café where they had stopped for lunch. When I arrived, much to my surprise, I found Antonio Andrisani, whose work I had also been writing about for years. He is the director of this film. I met Flavio Bucci and sat down with crew members Pascal Zullino, Marco Caldoro and Dino Centonze. Speaking a mix of English and Italian, Flavio Bucci told me about his career in theater, growing up in Italy under Fascist rule and his experience shooting a movie in this beautiful city of Matera, which he described as “living an incredible emotion in a small area of land that has so much history”. Andrisani, Zullino, Caldoro and Centonze all gave me their descriptions and thoughts of the film. Titled, Il Vangelo secondo Mattei, the idea is based on Pasolini’s Il Vangelo secondo Matteo (The Gospel According to St. Matthew) which was also shot in Matera. The protagonist of Andrisani’s film is none other than the petroleum with the potential damage of the drilling to the majestic, vast land of Basilicata. 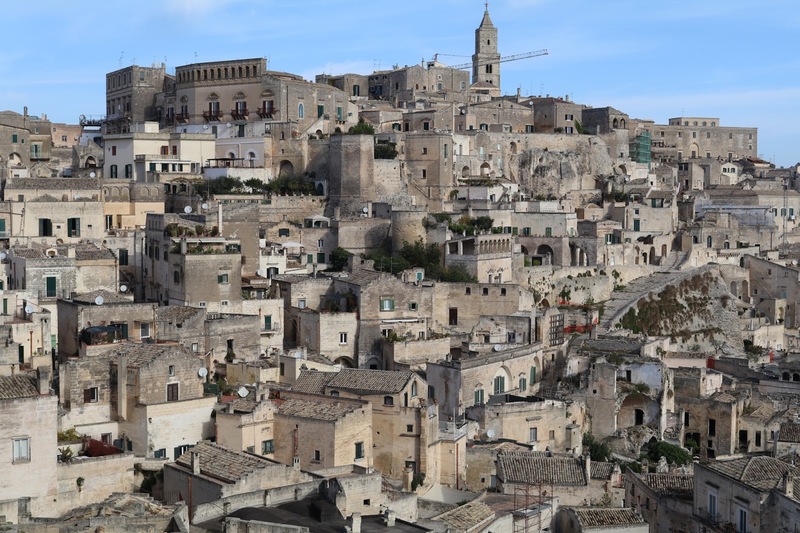 In fact, many scenes were shot in the areas of the province of Matera directly affected by the drilling. Although the story is very specific to the region, Andrisani has made a conscious effort not to provincialize the film, rather making it a universal story free of borders that anyone can relate to. The international cast alone gives testament to his effort. Andrisani tenderly pays tribute to Pasolini’s original with a special cameo by the Spanish actor Enrique Irazoqui, who portrayed Jesus Christ. Il Vangelo secondo Mattei is Andrisani’s first feature-length film. In 2014, he won a Golden Globe for his short film, Sassiwood. The film stars Sergio Rubini and is a satire poking some good-humored fun at the Hollywood film crews that always make their way to Matera to shoot biblical epics. Rubini had a part in Mel Gibson’s The Passion of the Christ, so he was the perfect protagonist. Speaking in an interview about his experience working on the film, he praised the Lucana Film Commission and the whole cast and crew for their professionalism and filmmaking expertise. Check back here for updates on when Il Vangelo secondo Mattei will be released. In the meantime, I recommend heading over to Andrisani’s YouTube channel, Hyperbros.com for a few good laughs.